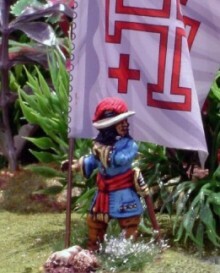 This chap is painted as a standard bearer character for my Spanish Colonial faction. He is the dismounted guidon bearer from the imminent to be released Dismounted Dragoons Command from Warfare Miniatures. Currently I am working on a lot of stuff related to the War in Ireland. My first WARFARE MINIATURES army will be Jacobite Irish and I have 3 regiments finished so far. As equipment and uniformity are both themes which recur often on the forum relative to this theatre and it seems, will remain somewhat shrouded in mist forever, there is some room to introduce additional options within the rules. This has prompted work on variant Foot units as follows Early in the war equipment was scarce for both sides particularly amongst recruit/volunteer units. I have created two optional Foot unit types which could be applied to Williamite or Jacobite Irish recruits. It could also I think be applied to militia units elsewhere. PIKE & SHOT A variation on the above but with a much higher proportion of pike than the normal line battalions. These may be Recruit or Drilled. They will represent poorer equipped units of either side. They will have the additional modest close combat bonus but not provide the enemy with the variable minus. They will look rather like my old TYW units with central pikes and 2 wings of shot. Again there are applications in other theatres for militia. There will be more specific theatre variant rule mods and these will tie in with the now underway BLB Jacobite Wars book which we have started work on now. My hope is to make this a very comprehensive guide to battles major and minor, uniforms, flags and orbats.